We post this quote predictably each year as Manufacturing Day approaches. This year, Manufacturing Day will be observed on October 7th. Although Manufacturing Day currently focuses on the United States, it serves as a model for other countries and offers opportunities for collaboration as an effort to achieve a broader reach. Where do you learn more? Host a lunch and share a few related fun facts. Make an announcement and post information throughout the organization networks. Sign a proclamation and invite local government representatives to join you and your team in recognition. If you’re a parent, provide the resources to your child’s school or even speak to your child’s class. According to this source, Manufacturing Day in the United States continues to achieve the objective of creating industry awareness among youth. 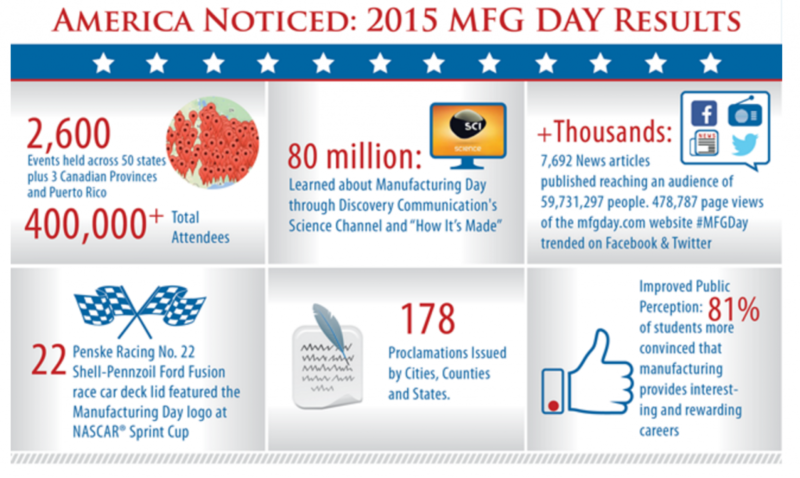 How will you observe and increase awareness this Manufacturing Day? Share your stories with us!